The Coal Mines site is app. a 1 1/2 hour drive from Hobart and 25-30 minutes from Port Arthur. A visit is a fascinating adjunct to any visit to the Port Arthur Historic Site. Entry to the Coal Mines Historic Site is free; there are basic picnic and toilet facilities at the site but it isn't staffed. Travel on road B37 from Taranna or Nubeena on the Tasman Peninsula. Ttake road C 341 at Premaydena for app. 13km. The final 3 kilometres of the road is unseasled. The walk is 1 kilometre one-way; allow app. 1-2 hours for the walk. Pets, firearms, metal detectors. Bikes must stick to formed tracks. This site once housed up to 600 convicts who worked in underground tunnels digging coal and dragging it out on trolleys. In 1839 there were 150 prisoners and app. 30 officers stationed at the mines. 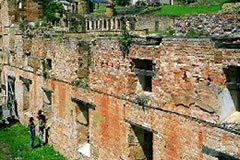 Large stone barracks which housed up to 170 prisoners, as well as the chapel, bakehouse and store had been erected. Today, they form imposing sandstone ruins. On the hillside above were comfortable quarters for the commanding officer, surgeon and other officials. Remains of some of these can also still be seen. Carts ran along rail and tram roads to the jetties for loading. Coal Mines Historic Site is situated on the Tasman Peninsula near Saltwater River and was developed to limit the colony's dependence upon costly imported coal from New South Wales, as well as serving as a place of punishment for the convicts from Port Arthur. The mine was operational for over 40 years. Coal Mines Historic Site is situated on the Tasman Peninsula near Saltwater River, close to Port Arthur and Eaglehawk Neck. Developed both to limit the colony's dependence upon costly imported coal from New South Wales, as well as serving as a place of punishment for the "worst class" of convicts from Port Arthur, the mine was operational for over 40 years and was Tasmania’s first operational mine. Deep shafts and building ruins. For safety, remain behind barriers and supervise children at all times.